Yes, we answer our phone 24/7, and can usually schedule a same-day or next-day appointment. 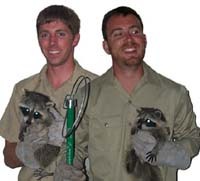 We have been in business since 2008, and now we are the most-trusted wildlife removal company in the San Antonio area. Give us a call any time to discuss your wildlife problem, and we will be happy to give you a price estimate on the phone and schedule an appointment to take care of the problem for you.